The Saugeen golf club is the best wedding venue in Bruce County. Second only to Cobble Beach in the entire region this golf course turned awesome wedding reception location caters to many brides from Port Elgin, Southampton, Goderich, Owen Sound, and the farming communities around Markdale. It is a beautiful open space which caters to weddings large and small with it's indoor space for 150 or the patio which can be the ceremony location as well as the cocktail hour spot. Jenny the wedding coordinator does a fantastic job of keeping everything together and running on time. When we come to a place like this we want to keep the feel of the natural setting and capture the moments for our brides and grooms many of whom are from Bruce Power. 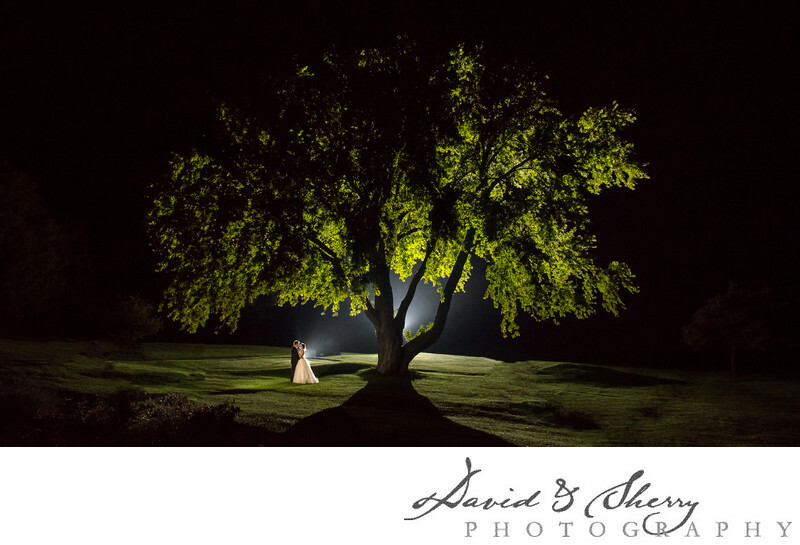 There is a large oak tree next to the clubhouse which in this photo we have lit up with a flash from behind with another on the couple in order to create a gorgeous night photo complete with the bride and groom kissing under the tree which has grown on the property for many decades. The clubhouse has windows all along the side of the room allowing perfect light to filter in for any indoor portion of the event. Location: Port Elgin, ON N0H 2C6.